A natural gas heating system is a great way to keep your home warm through our cold NYC winters, but Brooklyn residents need to keep some common-sense safety tips in mind. At Petri Plumbing, we want our neighbors to stay safe. Natural gas systems can be dangerous if they are not installed and maintained by professionals. If there is a gas leak, there are serious health risks and even a risk of explosion. But a few simple steps can protect you and your family. Natural gas safety starts at installation, whether it’s a whole new heating system or an appliance that uses natural gas. Natural gas systems and appliances should be installed by experienced, licensed professionals like our Petri Plumbing service experts. When hiring an installer, be sure to ask if they are licensed and accredited and read reviews of their work. If you bought your home with a gas system already installed, have it inspected by a professional before you move in. If you buy a second-hand gas appliance, have a professional inspect and install it before use. Scheduling yearly heating inspections and maintenance for your natural gas system and appliances helps stop leaks before they start. Over time, natural wear and tear will cause gas lines, hoses, valves, and seals to degrade and leak. We can identify these spots and fix them before they become a problem. Since gas lines run underground, homeowners can damage their own gas lines with a little well-intentioned yard work. Before you dig on your property, be sure to call the “Call Before You Dig” number at least 48 hours in advance. As a warning sign for homeowners, natural gas companies add an unpleasant smell to gas. If you smell the odor of rotten eggs in your home, get out. When your family is safe, call 911 and your natural gas company. 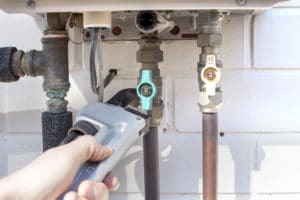 Once the gas is shut off to your home, you can call us at Petri Plumbing to fix the leak. Symptoms of carbon monoxide poisoning include feeling nauseous, dizzy, or unwell, but the symptoms disappear when you go outdoors. Petri Plumbing is here to help. If you have questions about your natural gas system, just call us at (718) 748-1254.